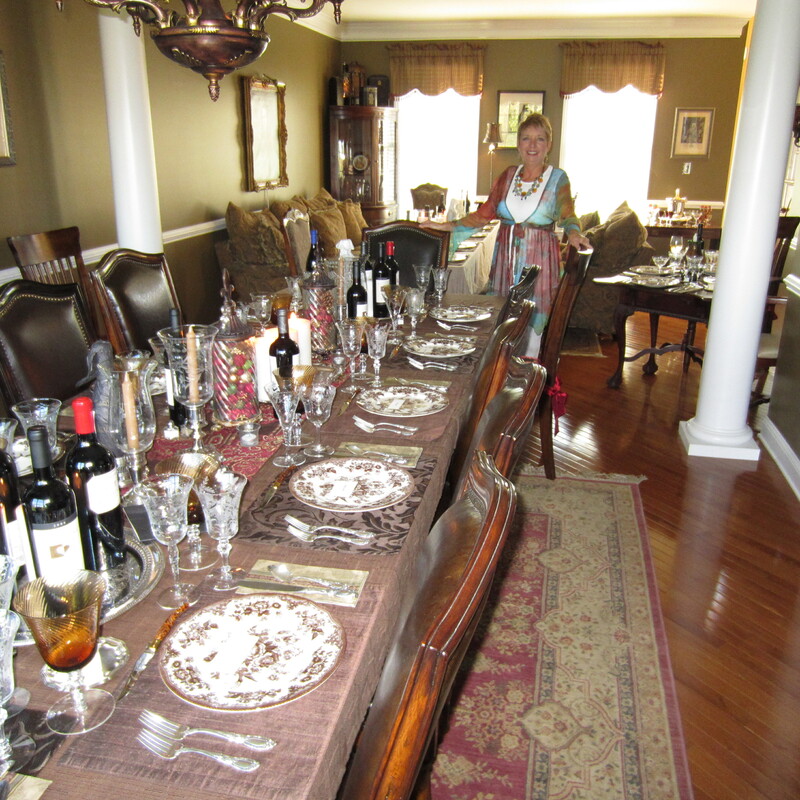 The above photo is a perfect example of how to set a table for a formal dinner party. You may not entertain at this level (there were 24 dinner guests at this affair), but you should still know table setting basics. If you go to all the work to prepare an awesome meal, then set your table like a pro. It is the backdrop for the meal. There are some basic rules about setting a table. Some can be broken, others not (at least in my humble opinion~Martha may differ). So let’s start with the basics and I’ll let you know which rules I bend based on the level at which I am entertaining. Plates are your navigational guide. They are your starting point. Make sure plates are positioned far enough apart to afford your guests comfortable seating. The rule is 2 feet from plate center to plate center. However, unless you have a large dining table, this may not be possible. You don’t want your guest bumping elbows, so if it’s a tight squeeze you might consider setting up a second table. Use a cloth tablecloth. I personally prefer white linen tablecloths because because it complments just about any color scheme you elect to use for your table setting. However, you will note in the above photo that an autumn color tablecloth was used as it was a perfect bacground for the Fall theme of the table setting. Unless you are camping or having a picnic at the playground, DO NOT use plastic tablecloths. Silverware is placed in the order it will be used. Start with the salad fork (if serving salad), then the dinner fork. These are placed to the left of the plate. Knifes and spoons go to the left and knife blade should be pointed toward the plate. If serving dessert, the dessert utensil goes above the plate. I could get real techie here about which direction the spoon, fork, or knife should go, but I won’t. If you get the dessert utensil above the plate, we’ll call it good. You can also just bring out the dessert utensils when serving dessert. It’s your call. I’ve done it both ways and it generally depends on what I’m serving and how large of a group I’m entertaining. Glassware goes to the right of the plate just above the knife. If you have multiple glassware, it should be positioned from shortest to tallest. Serving coffee with the meal? Coffee cup and saucer are placed to the right of the place setting. You can also elect to bring coffee out with dessert. The centerpiece should not block the view of your guests. If they have to peek around the centerpiece, it’s too tall. My rule of thumb… centerpiece should not be higher than breast level of your guest. It’s always nice to have place card name tags at each place setting when entertaining 6 or more. It’s OK to put cloth napkins on a dinner plate but they should NEVER be placed inside glassware. 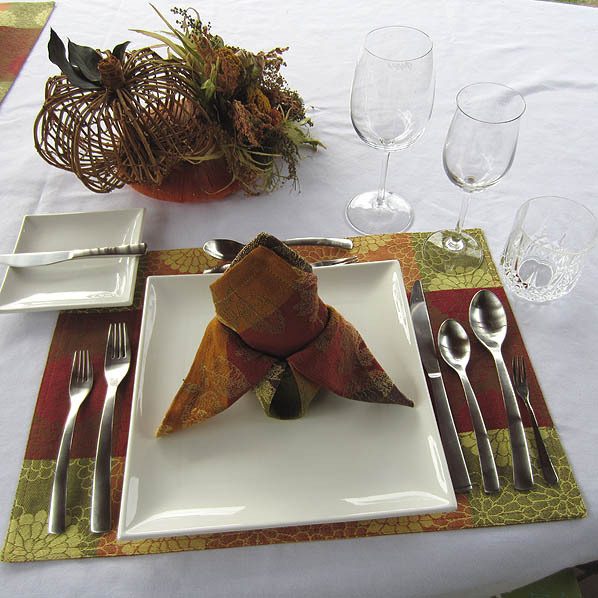 Placemats can be used at each place setting or every other place setting. They should add color and complement the theme of your table setting. Charger plates can be used, but the actual dinner plate should go on top of the charger plate. Charger or service plates are decorative in purpose and used to embellish your dinner plate. They should never be used for serving food. I, personally, only use a charger plate with the salad and first course. Placemats can be placed in various positions. 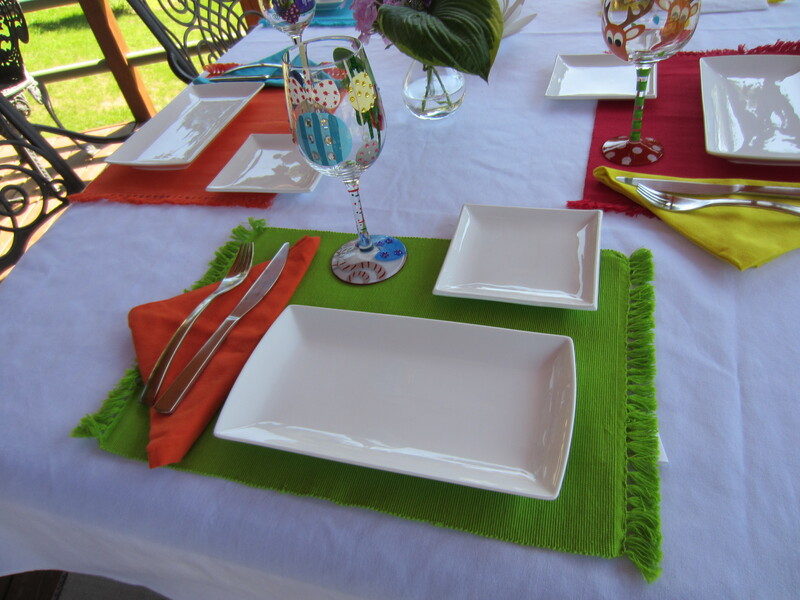 If I’m doing an informal luncheon, I will position placemats diagonally or even overlap two different colors. I also don’t pay such close attention to flatware placement. As you will note in the (L) photo, I have placed the fork and knife on the left side of the plate. Generally, a no-no but it works in this informal setting and no one is going to shoot you dead for it. The dessert plate is positioned where the glassware would normally be situated. I wouldn’t do this for a formal dinner party, but in an informal setting it is about eye appeal.